We iz halfway froo January alreddy I dunno ware da time goes *rolls eyes* and sadly for all yoo hoopawrents several fur babies haf joined me here ova da Bridge. I tries to welcome as many as me can dat I knows from Twitter, but dere's a lot me not know wile dey woz down on erf. I wait at da Bridge to show dem da way, cuz it vewy confoosin for dem sumtimes, if dey not been well for a short time or dey suddenly find demselves stood at da bridge wiv da mist swirling round dere paws. But dere is always a fur angel waiting, always. No fur eva crosses da Bridge on dere own. As for Mojo, well he's still da laid back old furbag he always been. Muvvers bin cutting his food down cos he woz extreemly over wayte. Fat to yoo and me. *rolls eyes agen* But he has lost some ov da blubber an now muvver can feel his ribs wich she cudn't before Christmas, cos dere woz a thick layer ov blubber ontop ov dem bahahahaha He seems better for losing da wayte, so she gonna keep him on diet til he got a body like Brad Pitt whoeva he is *puzzled ears* but dats who muvver tells him he gonna be like. She gettin senile I fink *shakes head*. I see dere's bin some fuss in da press abowt peanut butter and sumfing in it dats killing us furs! So fort I'd read up on it so muvver can scribe it down here for me to warn all yoo furs and yoo pawrents abowt it. Most people never ask the question, “Is Peanut Butter Safe For Dogs?” So most people don’t know that one of the top selling dog treats of all time is really bad for dogs. Yet pet store shelves are stacked with peanut butter flavored products. Peanut butter cookies, peanut butter stuffing … and even those of us who choose to bypass commercial foods, have been fooled into thinking that the occasional Kong stuffed with organic, sugar-free peanut butter is an awesome treat for dogs. So if you’ve been feeding your dog peanut butter as a treat and you’ve never wondered if that peanut butter is safe for dogs, then you might not like to hear what I’m about to say. But I think when I’m done, you might want to move peanut butter to the naughty – and downright dangerous – snack food list. Don’t know what aflatoxins are? These are naturally occurring mycotoxins that are produced by a fungus called Aspergillus. And peanuts have them in spades. Mycotoxins are one of the most carcinogenic (cancer-causing) substances on the planet … and they’ve also been shown to be toxic to the liver. Aflatoxin is known to cause liver cancer in laboratory animals … and it would probably do the same in your dog. Trans-fatty acids are one of the most toxic food substances today. Trans fats are the result of a highly toxic process that makes foods more stable, allowing them to sit on shelves for an extremely long time. Hydrogenation is the process of taking a plant oil, adding a nickel catalyst, heating it, and then removing the nickel catalyst. The result is a highly toxic fat that causes diabetes, heart disease and chronic inflammation. You’ll know if your dog’s peanut butter contains trans fats if it has hydrogenated or partially hydrogenated oils in the ingredients. If it does, then don’t buy it! And as if trans fats weren’t bad enough, roasting nuts can also cause the fats in peanuts to go rancid. So if you must feed peanut butter, then at the very least, make sure it’s raw and doesn’t contain hydrogenated fats. … like yeast (candida), bacteria, parasites – and cancer! The more we eat, the more they feast! Sugar can also cause diabetes, food allergies, premature aging and low level inflammation. And it feeds cancer cells. While peanuts are high in good monounsaturated fats, their omega 6 to 3 ratio is terrible! One cup of peanuts contains 35578 mg of omega-6 fatty acids and only 196 mg of omega-3 fats. Omega-6 polyunsaturated fatty acids (PUFAs) can trigger inflammation, so too much is not good. And the most common inflammatory conditions in dogs include allergies and joint disease. And, here’s something you might not know – there are peanut butter manufacturers adding xylitol to their ingredients. What’s So Dangerous About Xylitol? and other hardwood trees and fruits. Although it’s been used as a sugar substitute for decades, its popularity has increased dramatically in the last few years. Xylitol is manufactured into a white powder that looks and tastes similar to sugar. It’s about as sweet as sucrose, but contains only about two-thirds the calories. While xylitol is OK for humans, it’s extremely toxic to dogs. Even small amounts of xylitol can cause hypoglycemia (low blood sugar), seizures, liver failure or even death in dogs. The higher the dose ingested, the greater the risk of liver failure complications. 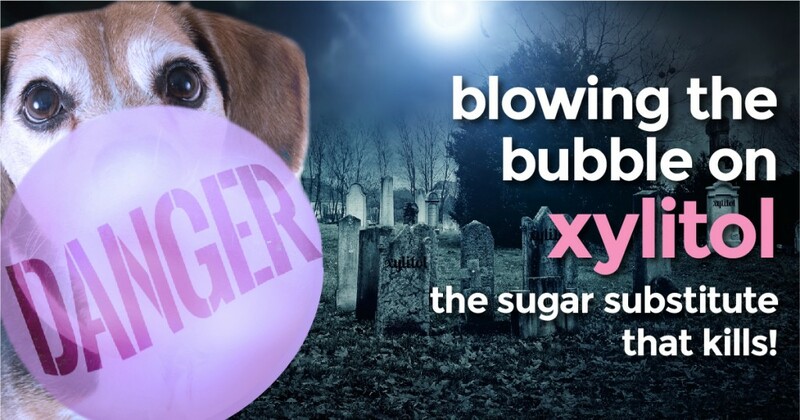 The most common source of xylitol poisoning reported to the Pet Poison Helpline is sugar free gum. As xylitol is becoming more popular and it’s included in more and more foods, we all have to be on alert as our dogs will also find these foods appetizing and a decent percentage of our best friends practice the art of stealth food burglary. While xylitol doesn’t stimulate the release of insulin from the pancreas in humans, it certainly does in dogs. 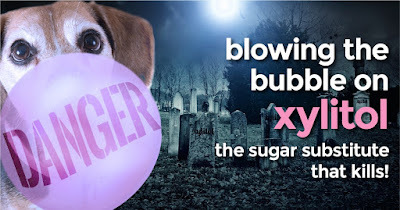 When a dog eats something containing xylitol, it’s quickly absorbed into the bloodstream, resulting in a potent release of insulin from the pancreas. This rapid release of insulin results in a profound decrease in the level of blood sugar (hypoglycemia) – an effect that occurs within 10 to 60 minutes of ingestion. Untreated, this hypoglycemia is often life threatening. There‘s no antidote for xylitol toxicity. The prognosis is good for dogs who are treated before symptoms develop or for dogs who develop uncomplicated hypoglycemia that is reversed rapidly. If liver failure or a bleeding disorder develops, the prognosis is generally poor. Most dogs who develop liver problems never make it. To make things worse, some manufacturers are adding this sugar substitute to peanut butter! (However, this is just one of many reasons NOT to feed your dog peanut butter. The first and most important thing to do is give glutathione. Glutathione exists in every cell. It protects the cell’s tiny but important engines, the mitochondria. This little protein made up of three amino acids is the king of all antioxidants in the body. Without it, cells would disintegrate from unrestrained oxidation. Our more familiar antioxidants, such as vitamins C and E, have short life spans and glutathione has the ability to bring back spent antioxidants from the dead and even recharge itself. Because all other antioxidants depend on glutathione to function properly, doctors call it the master antioxidant. Glutathione is the most important, abundant, most active and most powerful of the antioxidants. None of the over the counter antioxidants would work without the glutathione created in the cells. The highest level of glutathione exists in the liver and it’s no accident that the liver is the major organ of detoxification and desperately needs its glutathione to stay healthy. A (dog) patient had to get glutathione to protect and regenerate his necrotic liver fast as his liver was disintegrating from unrestrained oxidation. The patients owner literally ran to a compounding pharmacist who made up a form of glutathione that could be administered intramuscularly. The emergency service in the hospital agreed to administer it. The change was dramatic. The patient perked up and his liver enzymes began to go down. We also put him on several homeopathic remedies for the liver, including Aesculus, Ptelia, Chelidonium and Phosphorus. It’s important to note that although this patient had initially been given glutathione orally, as in standard treatment, it could possibly not have worked. That’s because the precursors are made into glutathione in the liver. His liver was in a double bind because its own cells were rotting and dying. They needed glutathione to repair themselves but they were too sick to be able to convert the precursors the patient was given orally. That’s why the glutathione needed to be administered intramuscularly. By the way, it can also be administered intravenously, but we would have had to wait for it to be shipped from California and there was just not time! Soon after treatment, the patient went home and was eating on his own and beginning to enjoy his walks again. His liver levels were normal but he still had elevated kidney levels, meaning he was too acidic. Both the kidneys and liver work much more efficiently in an alkaline environment (up to 40 times more efficiently), so the patient went on a vitamin C Intravenous drip to create alkalinity in his body and his kidneys responded and healed. The body’s organs can heal themselves with a little help from their friends (in this case the antioxidant glutathione). With xylitol becoming more and more common in foods, we should all remember glutathione is there, in case of emergency. Most compounding pharmacies can prepare this for you as an intramuscular solution. But because prevention is the best medicine, I recommend storing foodstuffs made with xylitol in a dog proof location; our canine friends love a delicious cupcake just as much as we do! Take care my fwends, I love yoo all vewy much and me always watching ova yoo!